Oberon, Inc. has been providing products and services to integrators and end users of wireless LAN "Wi-Fi" network and Distributed Antenna Systems (DAS) products. Oberon’s wireless enclosures and antenna products are used where the RF coverage, infrastructure security, environmental robustness and aesthetics are paramount in the network design and implementation. Oberon offers ceiling-mounted telecommunications enclosures for Ethernet switches, patch panels, wireless controllers and other networking and A/V components - ideal for structured cabling and Fiber-to-the-Enclosure (FTTE) deployments. 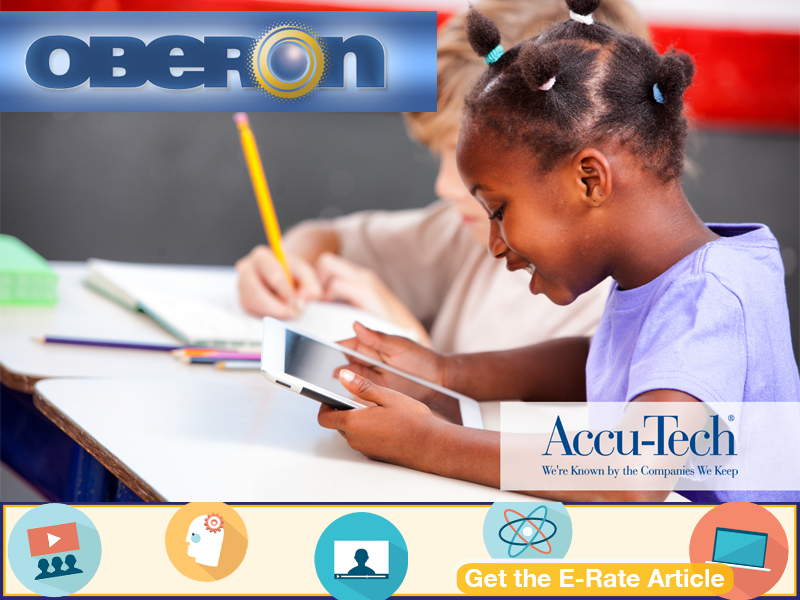 Download Oberon's E-Rate Article to find out what the recent increase in E-Rate funding means for your schools and school systems. Learn how much is expected to go directly to access points and Wi-Fi infrastructure. You'll also find solutions for the classroom, library, cafeteria, outdoors and more, all economical and built to last. This is the Cabling Installation and Maintenance webinar on cabling for educational facilities wireless networks, with emphasis on infrastructure to support the new 802.11ac and 802.11ad wireless Gigabit standards. This is the Cabling Installation and Maintenance webinar Powerpoint on wireless networks in hospitals. This presentation addresses the applications for wireless specific to hospitals, and requirements for ICRA compliance and other precautions necessary in the hospital environment. Contact your local Accu-Tech representative to learn more about Oberon's solutions.